Brownies with extra chocolate chips and a spicy-sweet kick! That should get people's attention. Try this twist on traditional brownies by adding a little chili powder and a little cinnamon. The great thing about Hallmark's Sweet & Spicy Chocolate Brownies recipe is that it makes just enough to fit a loaf pan or small skillet—perfect for two or three people. In a medium-size mixing bowl, stir together the flour, baking powder, cocoa, cinnamon, chili pepper and salt. In a 2-quart saucepan, add the butter and melt on low heat. Remove the butter from the heat and add the sugar. Add the eggs, one at a time, into the butter mixture. After the eggs, add the vanilla. Add the flour mixture to the butter mixture and combine until well blended. Grease small skillet or 8-by-4-inch loaf pan. If using a loaf pan, first line the pan with foil, making sure that the foil folds up and over the edges (this will help you lift the brownies from the pan later). Then grease the foil. Spread the brownie batter evenly in the skillet or lined pan. Sprinkle the dark chocolate chips all over the top of the brownies. Bake for 12 to 15 minutes, or until a toothpick inserted into the center of the brownies comes out clean. 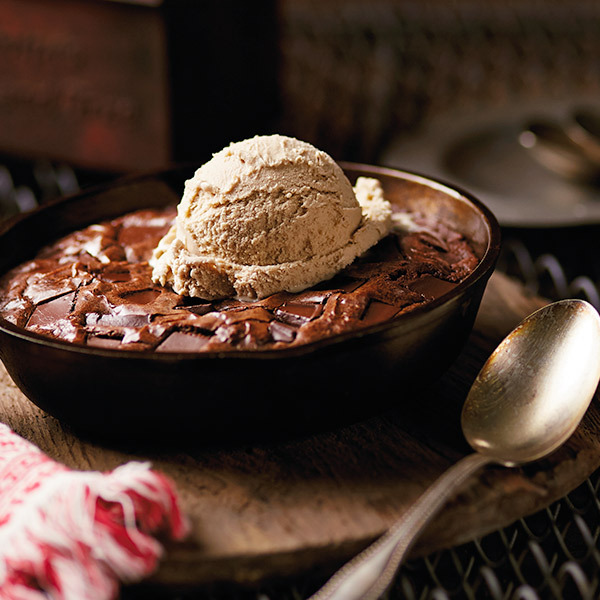 Remove from pan when cooled, using the sides of the foil, or bring the skillet straight to the table and top with ice cream.